Barbados, situated just east of the Caribbean Sea, is an independent island nation in the western Atlantic Ocean. At roughly 13° North and 59° West, the country lies in the southern Caribbean region, where it is part of the Lesser Antilles island-chain. Barbados is relatively close to the South American continent, around 434 kilometers (270 miles) northeast of Venezuela. Its closest island neighbors are Saint Lucia and Saint Vincent and the Grenadines to the west, Grenada to the south-west, and Trinidad and Tobago to the south, with which Barbados now shares a fixed official maritime boundary. Barbados' total land area is about 430 square kilometers, (166 square miles), and is primarily low-lying, with some higher regions in the island's interior. The organic composition of Barbados is thought to be of non-volcanic origin and is predominantly composed of limestone-coral. The island's climate is tropical with constant trade winds off the Atlantic Ocean serving to keep temperatures mild. Some more undeveloped areas of the country contain woodland and scrubland. Other parts of the interior which contribute to the agriculture industry are dotted with large sugarcane estates and wide, gently sloping pastures, with many good views down to the sea coast. Barbados has one of the highest standards of living and literacy rates in the world. Despite its small size, Barbados constantly ranks in the top 35 countries in the Human Development Index (HDI) rankings. It is currently ranked third in the Americas. 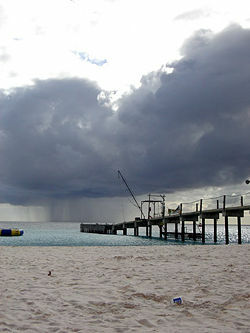 The island is also a major tourist destination. The origin of the name Barbados is unclear. Portugal was the first European country to "discover" and name the island. As early as 1511, the island is referred to as Isla de los Barbados (island of the bearded ones) in an official Portuguese document. It is a matter of conjecture whether the word "bearded" refers to the long, hanging roots of the bearded fig-tree (Ficus citrifolia), indigenous to the island, to bearded Amerindians occupying the island, or to the foam spraying over the outlying reefs giving the impression of a beard. Barbados is grouped as an island of the Lesser Antilles, although it is not strictly a part of the Lesser Antilles due to its different geological formation. It is situated 480 kilometers north of Guyana, 160 kilometers east of St. Vincent. This isolated pear-shaped island extends for 34 kilometers along a north-south axis and has a maximum breadth of 23 kilometers, giving it a total land area of 430 square kilometers. Barbados is fringed with coral reefs. The island itself is characterized by lowlands or gently sloping, terraced plains, separated by rolling hills that generally parallel the coasts. Elevations in the interior range from 180 to 240 meters above sea level. Mount Hillaby is the highest point at 340 meters above sea level. Farther south, at Christ Church Ridge, elevations range from sixty to ninety meters. Eighty-five percent of the island's surface consists of coralline limestone twenty-four to thirty meters thick; Scotland District contains outcroppings of oceanic formations at the surface, however. Sugarcane is planted on almost 80 percent of the island's limestone surface. The soils vary in fertility; erosion is a problem, with crop loss resulting from landslides, washouts, and falling rocks. Most of the small streams are in Scotland District. The rest of the island has few surface streams; nevertheless, rainwater saturates the soil to produce underground channels such as the famous Coles Cave. Barbados lies within the tropics. Its generally pleasant maritime climate is influenced by northeast trade winds, which moderate the tropical temperature. Cool, northeasterly trade winds are prevalent during the December to June dry season. The overall annual temperature ranges from 24°C to 28°C; slightly lower temperatures prevail at higher elevations. Humidity levels are between 71 percent and 76 percent year round. Rainfall occurs primarily between July and December and varies considerably with elevation. Rainfall may average 187.5 centimeters per year in the higher central area as compared with 127.5 centimeters in the coastal zone. Barbados is often spared the worst effects of the region's tropical storms and hurricanes during the rainy season as its far eastern location in the Atlantic Ocean puts it just outside the principal hurricane belt. The island does get brushed or hit about every three years and the average time between direct hurricane hits is about 26 years. The earliest inhabitants of Barbados were Native American nomads. Three waves of migrants moved north toward North America. The first wave was of the Saladoid-Barrancoid group, who were farmers and fishermen and arrived by canoe from South America (Venezuela's Orinoco Valley) around 350 C.E. The Arawak people were the second wave of migrants, arriving from South America around 800 C.E. Arawak settlements on the island include Stroud Point, Chandler Bay, Saint Luke's Gully and Mapp's Cave. According to accounts by descendants of the aboriginal Arawak tribes on other local islands, the original name for Barbados was Ichirouganaim. In the thirteenth century, the Caribs arrived from South America in the third wave, displacing both the Arawak and the Salodoid-Barrancoid. For the next few centuries, the Caribs—like the Arawak and the Salodoid-Barrancoid—lived in isolation on the island. Portuguese Conquistadors seized many Caribs on Barbados and used them as slave labor on plantations. Other Caribs fled the island. British sailors who landed on Barbados in 1625, at the site of present-day Holetown on the Caribbean coast found the island uninhabited. From the arrival of the first British settlers in 1627-28 until independence in 1966, Barbados was under uninterrupted British control. Nevertheless, Barbados always enjoyed a large measure of local autonomy. Its House of Assembly began meeting in 1639. Among the initial important British figures was Sir William Courten. Starting in the 1620s, an increasing number of black slaves were brought to the island. Five thousand locals died of fever in 1647, and hundreds of slaves were executed by Royalist planters during the English Civil War in the 1640s, because they feared that the ideas of the Levellers might spread to the slave population if Parliament took control of Barbados. The Barbadoes Mulatto Girl, after Agostino Brunias, 1779. Large numbers of Celtic people, mainly from Ireland and Scotland, went to Barbados as indentured servants. Over the next several centuries the Celtic population was used as a buffer between the Anglo-Saxon plantation owners and the larger African population, variously serving as members of the Colonial militia and playing a strong role as allies of the larger African slave population in a long string of colonial rebellions. As well, in 1659, the English shipped many Irishmen and Scots off to Barbados as slaves, and King James II and others of his dynasty also sent Scots and English to Barbados: for example, after the crushing of the Monmouth Rebellion in 1685. The modern descendants of this original slave population are sometimes derisively referred to as Red Legs, or locally "ecky becky," and are some of the poorest inhabitants of modern Barbados. There has also been large-scale intermarriage between the African and Celtic populations on the islands. With the increased implementation of slave codes, which created differential treatment between Africans and the white settlers, the island became increasingly unattractive to poor whites. Black or slave codes were implemented in 1661, 1676, 1682, and 1688. In response to these codes, several slave rebellions were attempted or planned during this time, but none succeeded. However, an increasingly repressive legal system caused the gap between the treatment of typically white indentured servants and black slaves to widen. Imported slaves became much more attractive for the rich planters who would increasingly dominate the island not only economically but also politically. Some have speculated that, because the Africans could withstand tropical diseases and the climate much better than the white slave population, the white population decreased. This is inconsistent with the fact that many poor whites simply immigrated to neighboring islands and remained in tropical climates. Nevertheless, as those poor whites who had or acquired the means to emigrate often did so, and with the increased importation of African slaves, Barbados turned from mainly Celtic in the seventeenth century to overwhelmingly black by the nineteenth century. As the sugar industry developed into its main commercial enterprise, Barbados was divided into large plantation estates that replaced the smallholdings of the early British settlers. Some of the displaced farmers moved to British colonies in North America, most notably South Carolina. 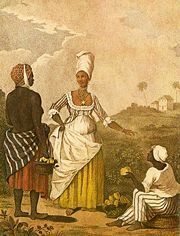 To work the plantations, West Africans were transported and enslaved on Barbados and other Caribbean islands. The slave trade ceased in 1804. In 1816, the continuation of slavery caused the largest major slave rebellion in the island's history. One thousand people died in the revolt for freedom, with 144 slaves executed and 123 deported by the king's army. Slavery was abolished in the British Empire 18 years later in 1834. In Barbados and the rest of the British West Indian colonies, full emancipation from slavery was preceded by an apprenticeship period that lasted six years. However, plantation owners and merchants of British descent still dominated local politics, owing to the high income qualification required for voting. More than 70 percent of the population, many of them un-enfranchised women, were excluded from the democratic process. It was not until the 1930s that the descendants of emancipated slaves began a movement for political rights. One of the leaders of this movement, Sir Grantley Adams, founded the Barbados Labour Party, then known as the Barbados Progressive League, in 1938. Though a staunch supporter of the monarchy, Adams and his party demanded more rights for the poor and for the people. Progress toward a more democratic government in Barbados was made in 1942, when the exclusive income qualification was lowered and women were given the right to vote. By 1949, governmental control was wrested from the planters and, in 1958, Adams became Premier of Barbados. From 1958 to 1962, Barbados was one of the ten members of the West Indies Federation, an organization doomed by nationalistic attitudes and by the fact that its members, as colonies of Britain, held limited legislative power. Adams served as its first and only "Prime Minister," but his leadership failed in attempts to form similar unions, and his continued defense of the monarchy was used by his opponents as evidence that he was no longer in touch with the needs of his country. Errol Walton Barrow, a fervent reformer, became the new people's advocate. Barrow had left the BLP and formed the Democratic Labour Party as a liberal alternative to Adams' conservative government. Barrow instituted many progressive social programs, such as free education for all Barbadians, and the School Meals system. By 1961, Barrow had replaced Adams as Premier and the DLP controlled the government. With the Federation dissolved, Barbados had reverted to its former status, that of a self-governing colony. The island negotiated its own independence at a constitutional conference with the United Kingdom in June 1966. After years of peaceful and democratic progress, Barbados finally became an independent state within the Commonwealth of Nations on November 30, 1966, with Errol Barrow its first Prime Minister. Politics in Barbados takes place in the framework of a parliamentary representative democratic monarchy, whereby the Prime Minister is the head of government of a pluriform multi-party system. The Executive power is exercised by the government while the Legislative power is vested in both the government and the two chambers of the Parliament. The political system is dominated by two main parties, the Barbados Labour Party and the Democratic Labour Party. The Judiciary of Barbados is independent of the executive and the legislature. Jurisprudence is based on English common law. The bicameral Parliament of Barbados consists of the House of Assembly and the Senate. The 30 members of the House are elected by universal suffrage to five-year terms. Elections may be called at any time the government wishes to seek a new mandate or if the government suffers a vote of no-confidence in Parliament. The Senate's 21 members are appointed by the governor general—12 with the advice of the prime minister, two with the advice of the leader of the opposition, and seven at the governor general's discretion. After years of peaceful and democratic progress, Barbados became an independent state maintaining full diplomatic ties to the Commonwealth of Nations on November 30, 1966. The overall constitutional safeguards for nationals of Barbados include: Freedom of speech, press, worship, movement, and association. The present government is proposing that Barbados become a republic within the Commonwealth of Nations, with a ceremonial president replacing the British Sovereign. This issue is still being hotly debated, as the island has been governmentally autonomous for decades and the Crown's position is strictly nominal. Barbados is a full and participating member of the Caribbean Community (CARICOM), the Caribbean (CARICOM) Single Market and Economy (CSME), the Caribbean Court of Justice (CCJ), which currently pertains only to Barbados and Guyana but is expected to replace the UK Privy Council for the entire English-speaking Caribbean eventually, and the Association of Caribbean States (ACS). There are two major and long-standing parties in Barbados—the Barbados Labour Party (BLP) and the Democratic Labour Party (DLP). Barbados has had several third parties since independence: The People's Pressure Movement, formed in the early 1970s, which contested the 1976 elections; The National Democratic Party, which contested the 1994 elections; and the People's Democratic Congress, which contested the 2008 elections; additionally, several independents have stood for election. Despite initial historical disparity (the BLP was once conservative and the DLP liberal), their modern incarnations are all moderate and have no major ideological differences. Electoral contests and political disputes often have personal overtones and voter sway tends to be based on tradition. The major political problems facing Barbados today are in promoting economic growth: Creating jobs, encouraging agricultural diversification, attracting small industry, and promoting tourism. Historically, the economy of Barbados had been dependent on sugarcane cultivation and related activities, but in recent years it has diversified into the manufacturing and tourism sectors. Offshore finance and information services have become increasingly important foreign exchange earners, and there is a healthy light manufacturing sector. In recent years the Government has been seen as business-friendly and economically sound. Since the late 1990s, the island has seen a construction boom, with the development and redevelopment of hotels, office complexes, and homes. Offshore finance and informatics are important foreign exchange earners, and there is also a light manufacturing sector. The government continues its efforts to reduce the unacceptably high unemployment rate which it met in the 1990s, encourage direct foreign investment, and privatize remaining state-owned enterprises. The main factors responsible for the improvement in economic activity include an expansion in the number of tourist arrivals, an increase in manufacturing, and an increase in sugar production. Recently, offshore banking and financial services also have become an important source of foreign exchange and economic growth. Economic growth has led to net increases in employment in the tourism sector, as well as in construction and other services sub-sectors of the economy. The public service remains Barbados' largest single employer. Total labor force has increased from 126,000 in 1993 to 140,000 persons in 2000, and unemployment has dropped significantly from over 20 percent in the early 1990s to 9.3 percent at the end of 2000. The economy of Barbados is susceptible to various issues. Fluctuations in tourist arrivals has a direct effect on the Barbados economy. In order to stabilize tourism the government has announced an initiative to host one major sporting event per year. In 2006, it was announced that the Sandy Lane Beach Hotel will host the Golf world cup. For 2007 several matches of the Cricket World Cup will be held on the island and the government promises that more big events will be lined up for 2008 and 2009. The Barbados government has also pursued "home porting" agreements with several cruise-lines. As part of the deal, the Barbados government negotiates with cruise-lines, tourists fly to Barbados and are transported to the Deep Water Harbor in Bridgetown to begin their Caribbean cruise. 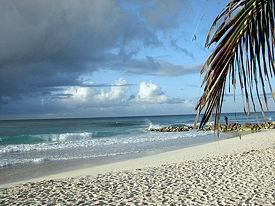 Barbados has considered the sea surrounding the island a natural resource. For centuries ocean–going fleets from Barbados would haul fresh fish and other marine species. Barbados was best known for the Flying Fish which at one time more heavily inhabited the warm waters around the island. Global pricing on fossil fuels also has a direct impact on the Barbados economy. Barbados remains one of the few islands in the Caribbean with an oil/gas field within its territory. The island currently has an exploration agreement with U.S.-based PhilipsConoco (and previously Mobil) around the Oistins, town of Christ Church. Oil and gas supplies in Barbados have been considered small and are used most commonly for local consumption to decrease the need to import some of the island's fuel. Under an agreement with neighboring Trinidad and Tobago since the 1990s, the government–owned Barbados National Oil Company allows all crude to be refined via Trinidad and Tobago's booming oil industry. The Trinidad and Tobago government in turn provides an equivalent amount of processed fuel back to Barbados, minus some oil to recoup the cost of refining. The remainder is returned to Barbados in the end product. The Government of Barbados refused to sign on to a deal with many of the other Caribbean islands and Venezuela known as PetroCaribe, citing it could force local privately owned companies out of business, since PetroCaribe partially seeks to re-nationalize all energy infrastructure. Another factor was that the Barbados economy could not forecast future costs from joining in PetroCaribe. In an effort to further decrease the island's over–dependence on oil, the Government of Barbados is investing in technologies to harness wind power for energy, as well as possibly using more of the islands' unused sugar cane for Ethanol fuel energy, similar to Brazil. In 1994-1995, Barbados found itself vulnerable to large changes in the earth's weather patterns. A (one in 150 year) drought gripped the entire island, preventing some residents from drawing adequate water supply and delivering a huge blow to the island's agriculture industry. In order to prevent a repeat of this event, the island entered into an agreement with the Ionics Co. to build a desalination water plant. After its completion the water plant was able to provide up to one-third of Barbados' total daily water consumption. Spending in Barbados continues to be one of the immediate problems to the Barbados economy and the island's cash reserves to peg the currency to the US dollar. Barbadians continue to import large numbers of cars from Asia, despite the government instituting higher duties to discourage spending. As many as 500 cars continue to be added to Barbados' roads every month, increasing chronic traffic problems and forcing the government to back more of this spending in order to maintain high levels in the nation's Foreign exchange reserves. Barbados has a population of about 280,946 (July 2007) and a population growth rate of 0.369 percent. Close to 90 percent of all Barbadians (also known colloquially as Bajan) are of African descent, mostly descendants of the slave laborers on the sugar plantations. The remainder of the population includes groups of Europeans (mainly from Britain, Ireland), Chinese, Bajan Hindus from India, and Muslims from Bangladesh and Pakistan, and an influential "Arab-Bajans" group mainly of Syrian and Lebanese descent. There are many people of Creole descent, a mixture of Afro-Caribbean and European descent, and many Afro-Bajans do have some British or Scottish antecedents. Other groups in Barbados include people from the United States, Canada, United Kingdom, and expatriates from Latin America. The country's official language is British English, the local dialect of which is referred to as Bajan, spoken by most. In religion, most Barbadians are Protestant Christians (67 percent), chiefly of the Anglican Church, but there are other Protestant, Roman Catholic, Jehovah's Witness, Hindu, and Muslim minorities. Barbados is currently a chief destination for emigrants from the South American nation of Guyana. The Barbadian culture is a blend of West African and British cultures. The Bajan, or Barbadian Creole, dialect is an iconic part of the culture. But English is still the official language, reflecting centuries of British rule. The island's British influence stretches back to 1625, when Captain John Powell claimed it in the name of King James I. The first colonists arrived two years later, founding a settlement of 80 civilians and ten slaves. Early on, Barbados adopted the British style of government, creating a Parliamentary democracy in 1639. During the colonial period, all members of the Legislative Assembly were white. After slavery was abolished in 1838, non-whites quickly began to play a role in the island's government, with the first minority member elected in 1843. Although Barbados gained full independence from Britain in 1966, it has retained its governmental style and remains a member of the Commonwealth of Nations. In addition to government, the British passed down their love of cricket. The most popular sport on Barbados, its cricket team has won numerous regional matches. Many players on the team go on to success on the West Indies team to compete in international games. One of the most highly regarded cricket players of all time, Sir Garfield Sobers, is a Barbados native. The country's architecture pays further testament to Britain, with many historic buildings still standing. In addition to traditional wood and stone, coral was also used in construction, lending a unique Barbadian flair. Jacobean, Georgian, and Victorian styles dominate. Slaves constructed many of these buildings, as well as their own chattel houses, and were thus an integral part of the island's architectural legacy. Built of wood, chattel houses were set atop blocks instead of permanent foundations so they could be easily moved from place to place. The vivid colors of these chattel houses exhibits West African influence. Religion plays an important role in life on the island. With its long British ties, the Anglican church serves the largest segment of the population. However, Roman Catholic, Baptist, Methodist, and other Christian denominations also support congregations. The Christian population celebrates its deeply-rooted faith in an annual festival, Gospelfest. Smaller Jewish, Hindu, and Muslim communities add some religious diversity. In addition to Gospelfest, Barbados holds many other carnivals and festivals. The Landship is a Barbadian tradition. It mimics and parodies the Royal Navy, while it incorporates music, dance, and games. The largest and most important festival in Barbados is Crop Over, which celebrates the end of the sugarcane harvest. Lasting three weeks, it includes fairs, parades, and contests. The music of Barbados is an important part of the country's culture. 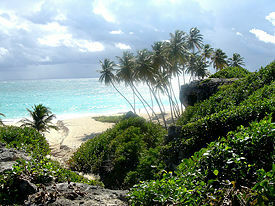 Modern Barbados has produced popular stars of calypso and the indigenous spouge style, and also has a large jazz scene. Reggae, soca, and tuk are popular as well. Every January, Barbados hosts the Barbados Jazz Festival. In mid-February, Barbados hosts the Barbados Holetown Festival which celebrates the arrival of the first English settlers. Several sports are played in Barbados. As in other Caribbean countries, cricket is a favorite sport. In addition to several warm-up matches and six "Super Eight" matches, Barbados hosted the final of the 2007 Cricket World Cup. The best Barbadian Cricket players go on to play for the West Indies Cricket Team. The West Indian cricket team, also known colloquially as The Windies or The West Indies, is a multi-national cricket team representing a sporting confederation of a dozen English-speaking Caribbean countries and British dependencies that form the British West Indies. In golf, the Barbados Open is an annual stop on the European Seniors Tour. In December 2006 the WGC-World Cup took place at the country's Sandy Lane resort on the Country Club course, an eighteen-hole course designed by Tom Fazio. The Barbados national football team, nicknamed Bajan Pride, is the national team of Barbados and is controlled by the Barbados Football Association. It has never qualified for a major international tournament. It came close to qualifying for the 2005 Gold Cup as it hosted the Digicel Cup finals for the Caribbean that acted as Gold Cup qualifiers, but finished fourth of the four teams. In 2001, it surprised many by making the semifinal round of the 2002 World Cup Qualifiers. In the first game of this round, they pulled off a shock 2-1 win over Costa Rica, but lost their five remaining games. The island of Barbados has a single major airport, the Sir Grantley Adams International Airport (GAIA) (IATA identifier BGI). It receives daily flights by several major airlines from points around the globe, as well as several smaller regional commercial airlines and charters. The airport serves as the main air-transportation hub for the Eastern Caribbean. It is currently undergoing a US$100 million upgrade and expansion. The island is well developed, and there are internationally-known hotels offering world-class accommodation. The southern and western coasts of Barbados are popular, with the calm light blue Caribbean Sea and their fine white and pinkish sandy beaches. Along the island's east coast the Atlantic Ocean side are tumbling waves which are perfect for light surfing, but a little bit risky due to under-tow currents. The 'Soup Bowl' near to Bathsheba is a very popular spot with surfers all year round. Shopping districts are popular in Barbados, with ample duty-free shopping. There is also a festive night-life in mainly tourist areas such as the Saint Lawrence Gap. Other attractions include wildlife reserves, jewelery stores, scuba diving, helicopter rides, golf, festivals (the largest being the annual crop over festival July/Aug), sightseeing, cave exploration, exotic drinks and fine clothes shopping. Transport on the island is good, with "route taxis," called "ZR's" (pronounced "Zed-Rs" not "Zee-Rs"), traveling to most points on the island. These small buses can at times be crowded, but will usually take the more scenic routes to destinations. They generally depart from the capital Bridgetown or from Speightstown in the northern part of the island. ↑ Dave Nilles, Can Ethanol Save the Economy of Barbados? Ethanol Producer Magazine, (September 2004). Retrieved August 11, 2007. ↑ Water-technology.net, St Michael BWRO Desalination Plant, Barbados. Retrieved July 25, 2007. ↑ Roy R. Morris, Car Boom, NationNews.com (January 15, 2006). Retrieved July 25, 2007. Hamshere, Cyril. The British In the Caribbean. Boston, MA: Harvard University Pres, 1972. ISBN 0674082354. O'Shaughnessy, Andrew Jackson. An Empire Divided—The American Revolution and the British Caribbean. Philadelphia: University of Pennsylvania Press, 2000. ISBN 0812217322. Rogozinski, Jan. A Brief History of the Caribbean - From the Arawak and Carib to the Present. New York: 1999. ISBN 0816038112. Scott, Caroline. Insight Guide Barbados. Singapore: Insight Guides; fourth edition, 1999. ISBN 0887290337. All links retrieved December 11, 2016. Barbados Government - official website. Parliament of Barbados official website. Barbados Tourism Authority - The Ministry of Tourism. Totally Barbados Island Guide Totally Barbados Island Guide. Barbados Independent Travel Guide & Business Directory. This page was last modified on 11 December 2016, at 19:52.